This level has medium difficulty. 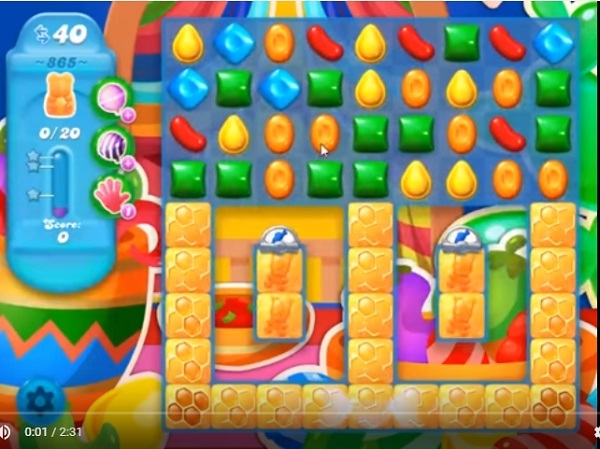 For this level try to play more from top part of the board and make striped candy. Combine striped candy with other special candy to break more honey blockers in bottom. Or watch video from below to get more help. Have played this probably 50 times. Can’t get it. I never get the board that you have. Struggling on this one for days. I have played this for two hours every morning and I have not won this game yet. I only have 18 bears not 20. I’ve never gotten the double power balls and I’ve play for at least two weeks. I Think this is the hardest level I’ve played so far. Level not fun at all & boring. Almost impossible to match vertical striped candy with another special candy. The special candies mostly blow up on their own before you can combine them. Lost count as to how many times have tried this level. Will not win this level until King is good and ready to give you a lucky board, if ever!